If you’ve sat through hours of information about internet marketing, taken pages of notes, but left none the wiser about how to actually apply that knowledge to your business, then you’re not alone. Most internet marketing talks and courses give you lots of information, facts and figures, but don’t go into specifics about how to actually apply that information to your own website. Helen’s sessions are different. As a strong believer in practical tuition, and a day-in-day-out internet marketing practitioner, she will share with you the nitty-gritty of how to actually apply the theory to your own website, with practical exercises, tips, and information to take away with you from the session. To help you remember what you have learned, Helen likes to make creative use of props and mnemonics, to help your new-found knowledge stick. As a qualified teacher and visiting lecturer at Birkbeck College, University of London and the University of Wolverhampton Business School, Helen not only has the subject knowledge but also the teaching and lecturing expertise to convey that knowledge clearly and memorably. 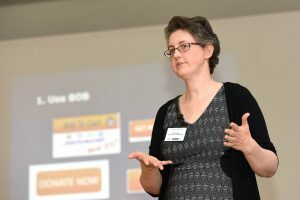 Interested in booking Helen to speak at your event? Get in touch.